poise [pronounced poiz] / noun / dignified, self-confident manner or bearing; composure; self-possession: to show poise in company. 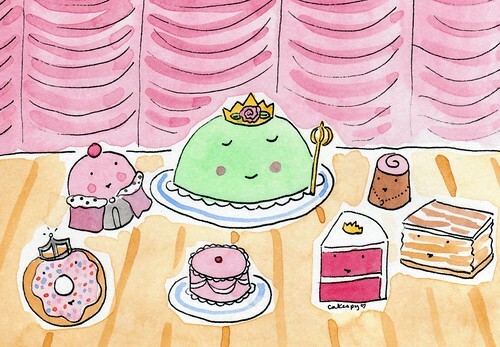 If ever there were a cake to embody the idea of this week's Illustration Friday theme of poise, it's got to be the Princess Cake. Regal and lovely, it's somehow not too showy; while it may not be a cake that is especially easy to make, when it does get made for special occasions, it's delicious enough to appeal to a variety of appetites; it's truly the people's princess (cake).